Since February 2nd is Groundhog Day, I’d like to share this groundhog themed trivet! Only 900 of these oversized castings were produced in 1956 by the Union Manufacturing Company of Boyertown, Pennsylvania (PA). ● On face: the Old German wording translates to 20th Annual Festival of the Grundsow Lodge Number One, On the Lehigh (River), February 1956 in Northampton, PA. 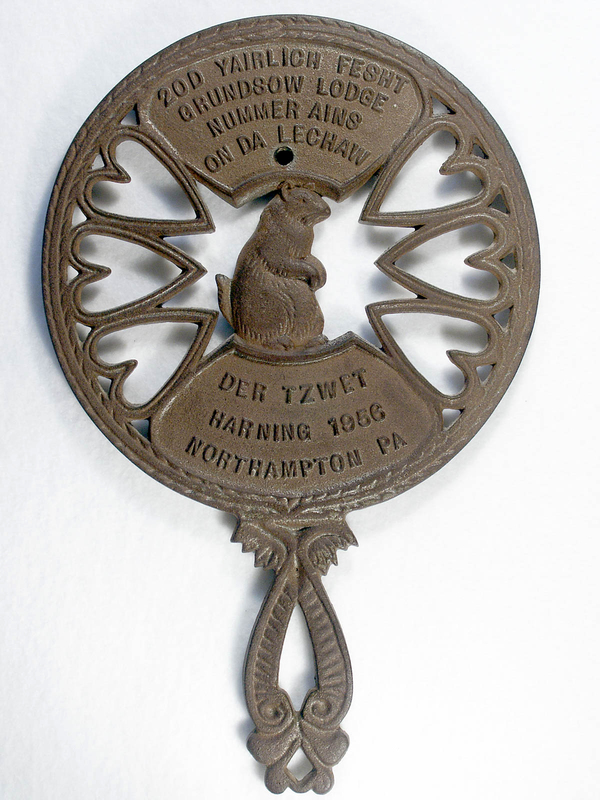 This is an example of a Pennsylvania Dutch fersommling (gathering) trivet. In more recent years the Unicast Division of Berkmont Industries, formerly Union Manufacturing Company (aka JZH), cast the majority of this style trivet. Pennsylvania Dutch is actually a misnomer, as the language is more correctly termed Pennsylvania Deutch, or Old German. The earliest settlers immigrated into the Lehigh, Berks, and Northampton counties of Pennsylvania from Germany in 1830 to 1840. They formed their own small enclaves, which were named after European towns or after an influential individual. Most of the settlers were Lutheran, emigrating to escape religious persecution. They perpetuated their beloved religion, language, customs, and art while blending with their American communities. Families today continue to gather at fersommlings, where they celebrate their German heritage in fun and fellowship. Grundsow (Groundhog) Lodge Nummer Ains (Number 1), the oldest and largest of the Pennsylvania groundhog lodges, was established in 1933 to preserve PA German language, culture and traditions. Seventeen Groundhog Lodges are still active today. As they celebrate Groundhog Day with food and festivities, the appointed die wedder barichda (weather forecaster) consults their mascot, usually a ceremonial stuffed groundhog, for insight into the course of winter. The small town of Punxsutawney, PA (population 5934) has celebrated their own version of Groundhog Day since 1886. The event grew slowly over the years, exploding in popularity after the 1993 Columbia Pictures – Bill Murray movie “Groundhog Day”. According to legend, if the groundhog Punxsutawney Phil sees his shadow, there will be six more weeks of winter; if he doesn’t see his shadow, we can look forward to an early spring. Up to 40,000 visitors now converge annually on Gobblers Knob for Groundhog Day, bringing in over $1 million each year to the local economy. This entry was posted on February 1, 2017 by Lynn Rosack in Contemporary Trivets and tagged Groundhog, Pennsylvania Dutch, Union Manufacturing Company.